The Prius v (the v is for versatility) is in reality a Prius station wagon. 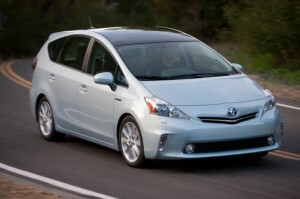 New for 2013 the Prius v breaks no new ground, it is simply a taller, wider and longer Prius. And, as you might expect, since it uses the same engine and drivetrain as the Prius, it is a vehicle so boring that it makes the regular Prius seem sporty. Still, there are worse things than boring (the Pontiac Aztec comes to mind). The Prius v is a reliable, fuel efficient vehicle that gets you where you want to go in reasonable comfort and with better than average fuel efficiency. 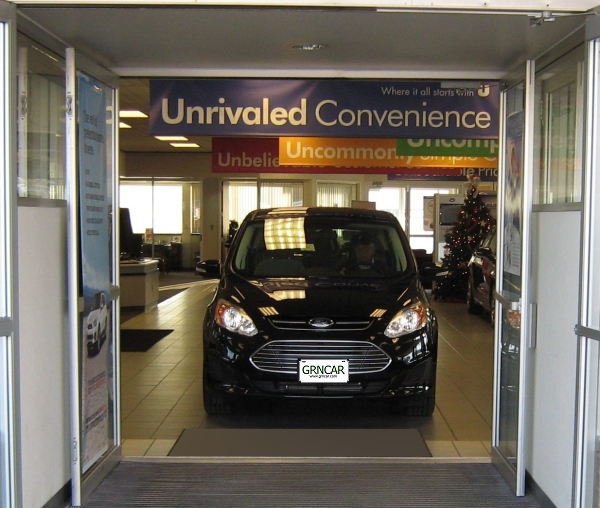 It has room for passengers and their luggage that you won’t find in other hybrids. So, If you are fine with driving what could be thought of as a small minivan, you will most likely be content with the Prius v.
However, if you believe driving is something more than getting from point A to point B, then the Prius v is not the car for you. It is painfully slow when accelerating (it has a “Sport mode” setting that is, at best, a cruel joke) the ride is soft, the steering vague. 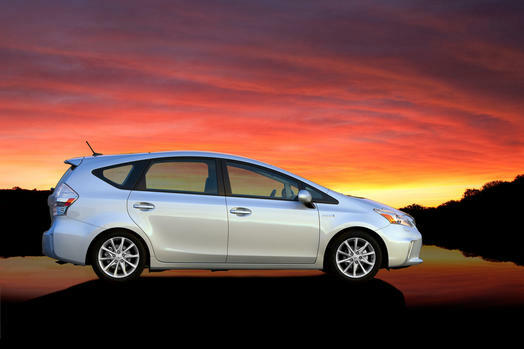 There is absolutely nothing about the Prius v that makes it fun to drive. A good example of what the Prius v might have been is the new Ford C-MAX. It is everything the Prius v isn’t. The C-MAX offers better MPG, better acceleration, crisper handling, and a solid ride yet still manages to seat 5 passengers in comfort and carry their luggage (but not quite as much luggage as the Prius v – the Prius v excels in terms of cargo space). Where the Prius v doesn’t excel is in fuel efficiency. Because the Prius v uses the same engine and drivetrain as the Prius, yet is larger and heavier, it is no surprise gas mileage suffers. Where the Prius averages 51 city, 48 highway miles per gallon; the Prius v only manages 44 city, 41 highway. In addition to boring, the Prius v is also expensive, starting at $26,550 (not including destination fees) but in its defense it does come well equipped. Toyota’s Smart Key System with push button start and remote vehicle illumination are standard, as well as a rear back-up camera. 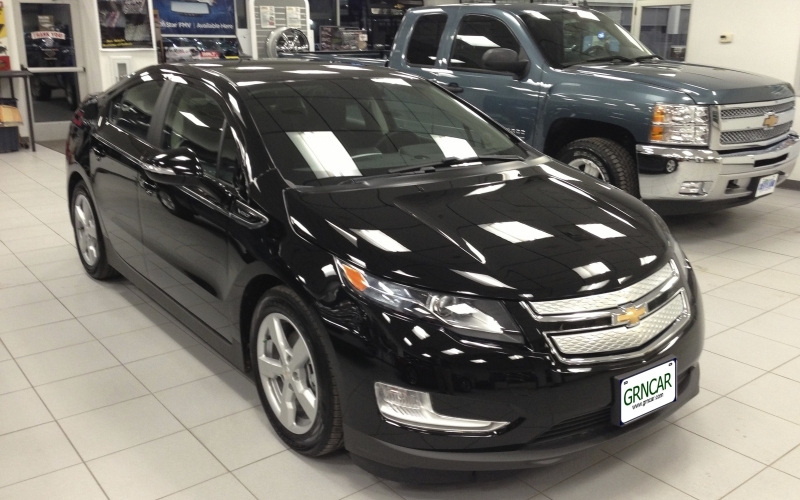 Also standard is automatic climate control, power lumbar support, and a tilt/telescoping steering wheel. 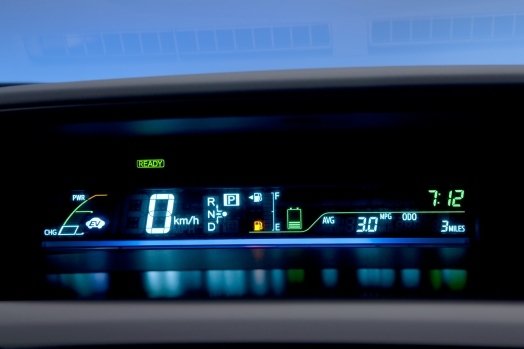 The Prius v dashboard readouts are better than most hybrids. The Prius v interior is well laid out and a significant improvement over the standard Prius. The dashboard displays are easy to read – not always the case with hybrids – and there is a well placed, easy to use, armrest/storage compartment. The seats are comfortable and the standard power lumbar support makes them even better. 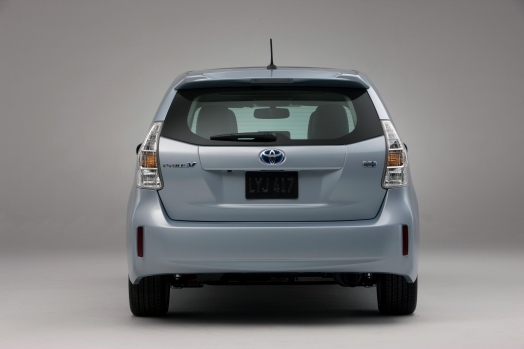 Unlike the Prius, the Prius v has a one-piece rear window. The biggest improvement for the Prius v is visibility. The split rear window of the regular Prius is gone, replaced with a more traditional one-piece unit. The one-piece rear window combined with the standard back-up camera makes parallel parking the Prius v much less of an adventure. Also, winter driving visibility should be improved because the windshield wiper on the Prius v clears a much larger portion of the rear window when compared to the regular Prius. Visibility to the front and sides is also improved thanks to larger windows. Overall, the Prius v is more evolutionary than revolutionary. Toyota took a solid vehicle in the Prius, stretched it and raised it and thereby made a decent family vehicle out of it. It won’t win any races but it is reliable transportation that will get you where you need to go in reasonable comfort. 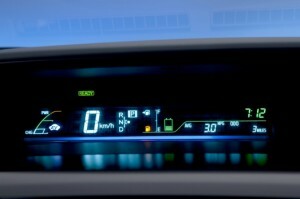 If you have any questions about the Prius v, feel free to leave a reply. I try to answer questions within 36-hours, often sooner.